With so many outdoor fire pits on the market, it’s hard to select which style is right for you. If you prefer to stick with the very best, go with a Weber. 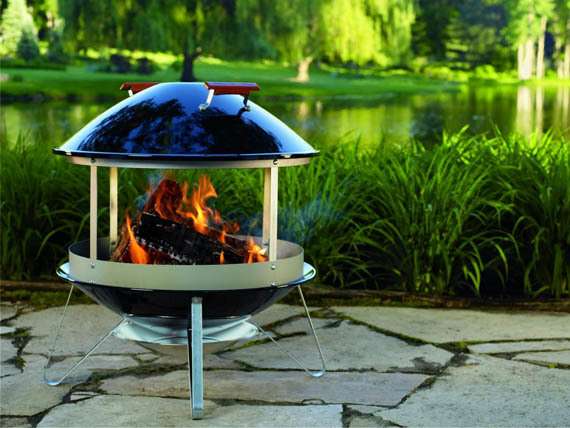 They make the best grills, so it only makes sense that they would make the best outdoor fireplace. The 2726 Wood Burning Fireplace creates a warm and relaxing atmosphere anywhere. Made of heavy-gauge steel construction, the lid and bowl are porcelain enameled, that won’t rust, fade or burn. The heat shield is made of rust-resistant aluminum, and the support ring is galvanized steel. Ultimate construction, good looks and a warm glow should equal more than a few beautiful nights.